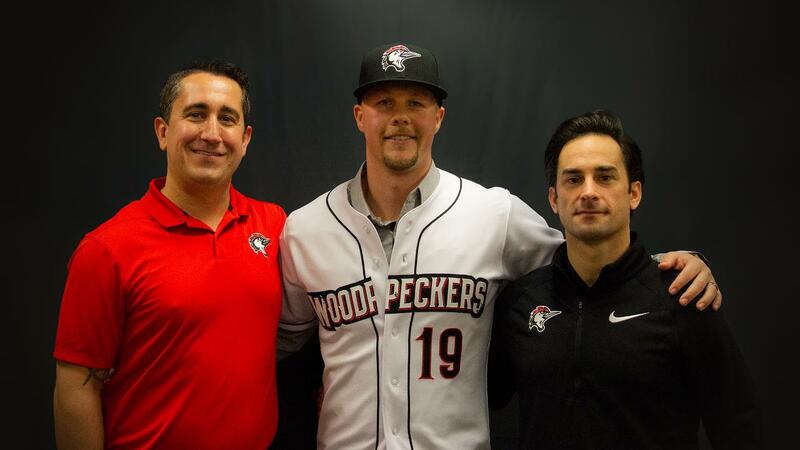 The Fayetteville Woodpeckers, Class A Advanced MiLB affiliate of the Houston Astros, announced today Nate Shaver as Manager for the club's 2019 inaugural season. Shaver joined the Astros in 2018 as the Development Coach for the Buies Creek Astros, where he helped lead the club to a Carolina League championship. Shaver played collegiately at New Mexico State University, earning multiple all conference and all tournament awards as an outfielder. He played professionally in the independent Frontier League before coaching at Wake Technical Community College, New Mexico State University, and the Houston Astros organization. While coaching at New Mexico State University, Nate completed baseball related research in fulfillment of his PhD concentrated in Education: Learning Design and Technology. His research focused on improving baseball hitting skills through the application of learning theory while utilizing video feedback and evaluating individual differences. "The Houston Astros have top-to-bottom one of the most talented collection of players in professional baseball," said Mark Zarthar, President of the Fayetteville Woodpeckers. "Talent aside, the physical training and character development of these young men is at the heart of our organization's success. Nate's role is crucial in improving our players and advancing them to Houston." "We look forward to working with Nate in Fayetteville and watching him lead our team on the field," said David Lane, General Manager of the Fayetteville Woodpeckers. "He is a well-rounded individual with years of professional experience. His impact in Buies Creek was significant as the team was able to capture the Carolina League title. We expect Nate to lead the Woodpeckers to another Championship here in Fayetteville." Joining the Shaver on the Fayetteville coaching staff for their first season with the Astros organization will be Thomas Whitsett (pitching coach) and Jason Kanzler (hitting coach). Whitsett joins the Astros from the University of Arizona, where he served as the Director of Player Development-Pitchers. Whitsett previously served as the head baseball coach at Pleasant Valley High School, and the pitching coordinator for the NORCAL Baseball Club. Kanzler has spent the last two years as an assistant baseball coach at Katy High School, and an assistant coach for the Brewster Whitecaps of the Cape Cod Baseball League. A 20th round pick by Minnesota in 2013, Kanzler played three seasons in the Twins minor league system. The Houston Astros own and operate its Class A Advanced minor league affiliate, the Fayetteville Woodpeckers. The Astros agreed to a 30-year lease and are invested in the long-term success of the City of Fayetteville. The team's direction focuses on creating a culture of success with an accessible management team, building the best young talent in baseball, engaging with fans, and connecting the community with an exciting, family-friendly experience. For more information on the Woodpeckers, please visit www.fayettevillewoodpeckers.com. Fayetteville is proud of its rich role in our nation's history and holds fast to the friendly feel of a true hometown, while providing the cultural and entertainment amenities of bigger cities. The city boasts sophisticated restaurants, museums, musical and sporting events, and nearby Fort Bragg - the nation's largest military installation - that solidifies the city's deep roots in all things military. Fayetteville is the sixth-largest city in the state and home to more than 208,000 residents. The state-of-the-art sports and entertainment venue is expected to be a catalyzing economic development tool that attracts and retains business, provides national exposure, increases civic and community pride, and provides for an improved quality of life for residents. It features natural grass, a 25x70 LED scoreboard, six luxury suites, four field boxes, a premium club level, outdoor party deck, a kids zone, and more. Construction is scheduled to be completed in March 2019 with Opening Day slated for April 18th, 2019. The 2017 World Champion Houston Astros have been Houston's hometown baseball team since 1962, when the Colt .45s first took the field in Colt Stadium. Three years later, the team became the Houston Astros as a tribute to America's "Space City" and will be entering their 58th season in Major League Baseball. In 2013, the Astros moved to the American League West Division, becoming the first franchise to move from the National League to the American League. The Astros are also the only team in MLB history to have won both an American and National League pennant. For 81 regular season games a year, the Astros can be found on their home field at Minute Maid Park, where families and friends come together to enjoy America's favorite pastime in one of baseball's most comfortable and fan-friendly ballparks. In addition to striving for success on the field, the Astros take pride in their local community and are committed to making Houston a better place by honoring our nation's military, combatting homelessness, aiding in the fight against cancer and supporting youth baseball and softball through the Astros Foundation's cornerstone programs. For more information on the Astros, please visit www.astros.com.